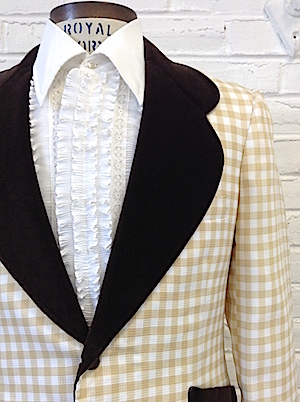 Home > Vintage Suits & Blazers > Jacket Size: 38-41 > (40, tallish) 1970s men's Tuxedo Jacket Tan & White checkered w/ Brown VELVET lapels! 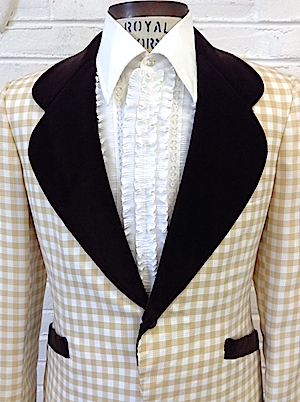 Men's vintage 1970s tuxedo jacket! Cut-away design; perfect to show off your ruffles! 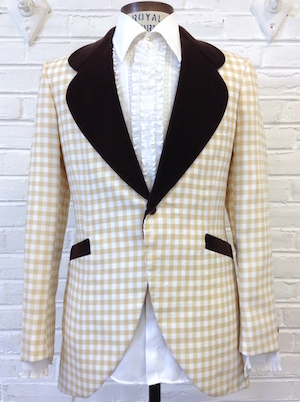 Tan & white checkered pattern. Soft chocolate brown VELVET super-wide rounded lapels and on the pockets. 100% polyester with a "seersucker" type texture of tiny squares. One medium brown button closure. One accent button on the sleeve cuffs. Made by After Six. Really, really cool vintage tux! I have 2 jackets in this style & size. Condition: Very Good. These are former rental tuxs, expect normal wear. No rips, stains, etc.. Chest: 40" Jacket is tagged a 41" but we are measuring it closer to a 40"